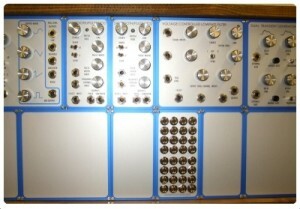 40 years ago in the early 70s two Californian university graduates set up a small company making a high quality modular synthesizer. 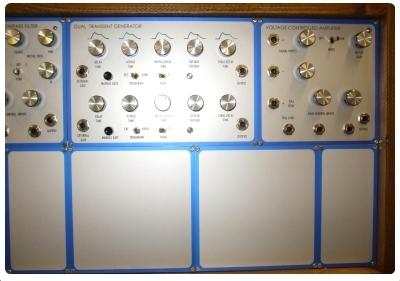 The company they formed was called Emu and from the humble beginnings of their modular system they went on to produce a whole host of innovative electronic instruments. 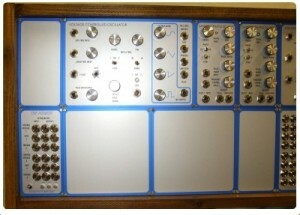 The Emu Modular system is a classic and it was pioneering. The Exclusively Analogue modular system project was started to fulfil the need Tony had to re-house his original Emu system submodules and developed from that. 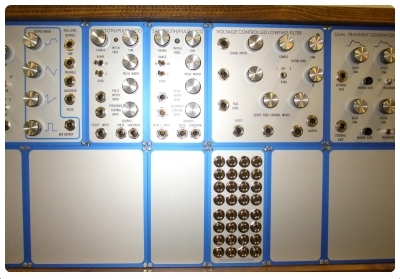 The primary modules, Voltage Controlled Oscillator (VCO), Sawtooth Pulse VCO (SPVCO), Voltage Controlled Low Pass Filter (VCLPF), Dual Transient Generator (DTG), and Voltage Controlled Amplifier (VCA) have been recreated and faithfully reproduced as a ‘Tribute’ to the Emu modular. They will only be available in extremely limited numbers, a total of 10 sets. 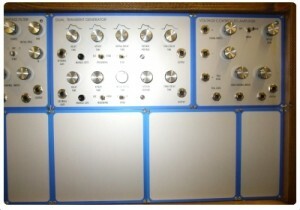 Note: The “Tribute” and “Pioneer” systems are currently not available for purchase due to a shortage of components.